Iranian security forces re-arrested prominent human rights lawyer Nasrin Sotoudeh on June 13 in Tehran, her husband said in a Facebook post. “A few hours ago, Nasrin was arrested at home and sent to the court at Evin [prison],” Sotoudeh’s husband Reza Khandan wrote. “I once told investigators in the investigation room: Of all the things that a government must do for its country, you only know one, arresting people.” Khandan did not say what charges Sotoudeh may face. “Khandan said she managed to call him after she was detained. He said she was told she would be serving a five-year sentence at Evin prison, Tehran, after being convicted in absentia. “I have no idea what the sentence was related to,” said Khandan in a report by The Guardian. Sotoudeh recently represented a number of women who removed their headscarves, or hijab, in public to protest against Iran’s mandatory dress code for women and were later arrested. The protest is also known as Girls of Revolution Street Protest. “The women were charged with “a sinful act” and “violating public prudency” as well as “encouraging immorality or prostitution.” The charges carried sentences of up to a decade in prison,” reported The New Yorker. The human rights lawyer had recently also spoken out against a new criminal code that only allowed a small number of lawyers, 20 in Tehran out of the total 60,000, to represent individuals charged with national security crimes. “Arbitrary detentions are common within Iran’s opaque judicial system. Many political prisoners are kept in solitary confinement and not allowed to see their families for long periods, according to human rights groups. Iran also has one of the world’s highest rates of capital punishment. Iranian judiciary officials say it is their duty to uphold the country’s Islamic values as codified in Iranian law,” reported Reuters. 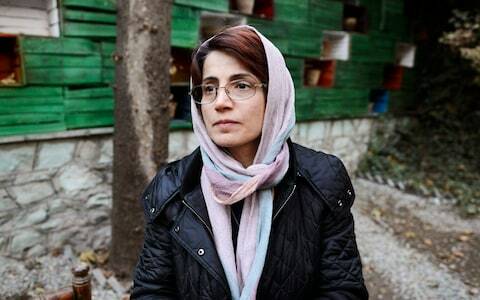 Sotoudeh, who has represented Iranian opposition activists, was sentenced to six years in jail in 2010 and banned from practice after being convicted of spreading propaganda and conspiring to harm state security. Her case came to international attention in 2012 when she embarked on two hunger strikes against the conditions in Evin prison and a travel ban on her daughter. She was subsequently released in 2013 shortly before the newly elected President, Hassan Rouhani, was due to speak at the United Nations. The European Parliament awarded her the 2012 Sakharov Prize for Freedom of Thought. “She was detained to prevent her from holding this public protest,” Hadi Ghaemi, the executive director of the Center for Human Rights in Iran, which is based in New York, told me. “Her arrest was Orwellian, as the agents carrying it out claimed she has a five-year sentence in a case that has been decided in secret. She and her husband have no idea of when this prosecution took place, under what charges, and based on what evidence. That is an unbelievable miscarriage of justice,” reported The New Yorker.